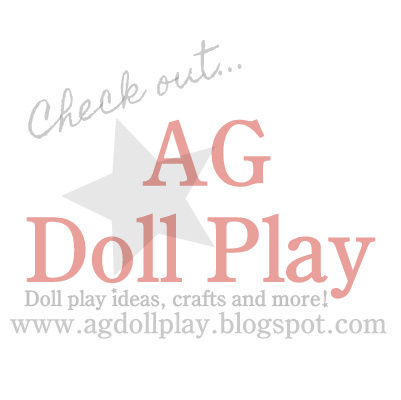 American Girl Doll Play: A Little Folk Art for Our Kitchen Area! A Little Folk Art for Our Kitchen Area! We are trying to "dress up" our kitchen area for the dolls here and one of the recent additions that we did was to make a little faux cross-stitch wall decoration using some foam core board, a printed cross-stitch image found online (google cross-stitch for your kitchen and you will find some cute ones), some scrapbook paper and some basic tools like scissors, a craft knife, glue, etc. I already has some left over foam core board from another project so I just used a scrap of that and glued my cross-stitch image on to a portion of the board and then cut it out. I then glued my patterned paper (which was a bit larger than my cross-stitch to leave a border) to some more of the foam core board and cut that out as well. I inked up the edges of foam core board just for fun, you do not need to do this. Zoey went outside and found some small twigs and we broke them to be the right size for bordering the cross-stitch. I attached the twigs using a hot glue gun. Here is our finished piece of folk art! Here it is hung above our kitchen sink and stove. Isn't it so sweet? It was just the right touch for making our kitchen area feeling a bit more homey. Now we need to think of what to do for the table area...it's looking pretty bare currently. What I really would like is to find a longer, white shelf to put little nick-knacks on. :) We shall see! So cute! We spent the night doll crafting last night, too. :) Thanks for sharing! It's so fun isn't it? I have some more little projects that I hope to get to today. Enjoy your day! I love the kitchen set! Can you share where you got it? I got it from an adult collector and it's an older Our Generation brand wooden kitchen! I've seen it on eBay too so search it out!! We love it! so cute! for anyone who wants to make their own sampler, go to AG Play and play Felicity's Colonial Adventure.